South Africans may have enough on their plates at the moment in terms of the ongoing inability of Eskom to fulfil the country’s daily energy needs. But experts warn that the country’s water situation is rapidly heading in the same disastrous direction — as recent events in Beaufort West and Makhanda have starkly illustrated. This statement, released by emergency aid group Gift of the Givers on Wednesday, reads like a scene from a post-apocalyptic novel. Yet its reflection of the situation in Makhanda (formerly Grahamstown) is essentially “accurate”, according to local newspaper Grocott’s Mail editor Sue Maclennan. The Department of Water and Sanitation did not respond to Daily Maverick’s request for comment on Wednesday. Earlier this week, however, spokesperson Sputnik Ratau was quoted by News24 as saying that it was not the department’s responsibility to deliver emergency water supplies to towns in crisis, such as Makhanda. “It is our responsibility to say to a municipality that you cannot allow that thing to happen,” Ratau was quoted as saying. Enter the charity, Gift of the Givers, which has come to the aid of other South African towns in similar water-strapped states, including Beaufort West in the Western Cape. As it has done elsewhere, the group dispensed bottles of water and drilled boreholes. Gift of the Givers leader, Dr Imtiaz Sooliman, said in a statement that the group has drilled 200 boreholes within an eight-month period. “There are many grateful people in this town today,” Maclennan told Daily Maverick. Makhanda’s current crisis represents the culmination of what happens when municipal and governmental mismanagement collides with drought — and it is a picture playing out in different areas across the country. The Western Cape government announced this week that Beaufort West received 0mm of rain in December and 2mm of rain in January — as compared with its usual average December rainfall of 28mm and January rainfall of 20mm. Compounding the situation in the town is the age-riddled and asset-stripped water infrastructure. “In Beaufort West, leaks are estimated to see 40% of water waste away,” Western Cape local government spokesperson James-Brent Styan told Daily Maverick. Styan says that other water-starved areas in the Western Cape include Kannaland, which encompasses Calitzdorp, Zoar and Ladismith, and Laingsburg. “The real disaster is in the agricultural sector,” said Styan. Another Western Cape official put it more bluntly: The agricultural sector is “completely buggered”. To the list of water-critical areas, Water Shortage SA CEO Benoit le Roy adds Mathjabeng and Harrismith in the Free State and Bethal and surrounds in Mpumalanga. “These are, in my opinion, merely symptoms, not unlike Eskom, of the onset of total collapse of water infrastructure in SA,” Le Roy told Daily Maverick. In May 2018, the Department of Co-operative Governance and Traditional Affairs classified 87 municipalities — 31% of the country’s total — as “dysfunctional or distressed”, a diagnosis which almost always makes itself felt in problems with the municipal water supply. Le Roy rattles off a list of causes of the country’s water problems, ranging from a lack of leadership in the notoriously poorly performing Department of Water and Sanitation to “cadre deployment in local municipalities where the management of water budgets, resources and assets is dysfunctional”. In Le Roy’s view, South Africa’s water situation is “far more serious” than its Eskom-instigated energy woes. “Our water reserve was officially declared 98% allocated in 2002. This means that no new water is practically available. We are water-scarce in the entirety (of) South Africa,” he says. 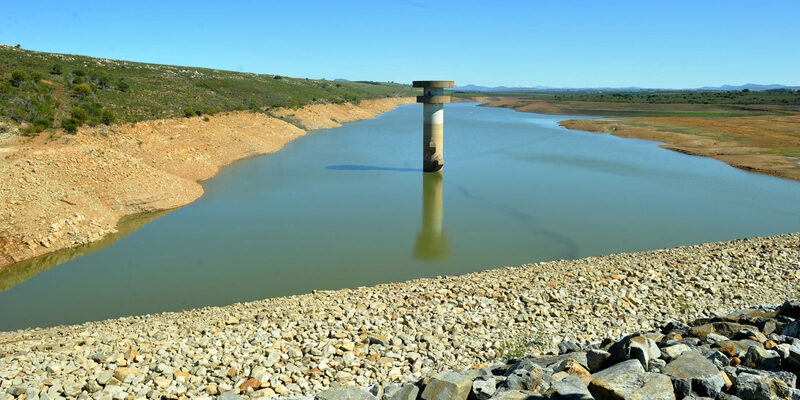 Since the beginning of February 2019 alone, the Department of Water and Sanitation has issued statements warning citizens to curtail water usage in the Eastern Cape, North West, Mpumalanga and Gauteng, largely as a result of dropping dam volumes. Worryingly, most of South Africa’s annual rainfall occurs during the summer months. As Daily Maverick’s Kevin Bloom noted in a recent critique of the government’s gas exploration plans, the Department of Environmental Affairs has previously stated that South Africa is warming at twice the global average. In 2015, however, Parliament heard that upgrading South Africa’s water and sanitation sector to ensure the necessary water resilience was likely to cost about R870-billion. Le Roy’s organisation, Water Shortage SA, has recently teamed up with the Organisation Undoing Tax Abuse (Outa) to call for an independent water regulator to exert some measure of oversight on the problem. “The Department of Water and Sanitation’s failure to effectively regulate South Africa’s water sector requires serious and effective intervention,” the two groups said. Le Roy says this body would be the first step towards “reinstating governance in the water sector”. Thereafter, a new workable national water strategic plan should be drafted and implemented, and the relevant experts appointed within all three spheres of government. “Without these three steps we cannot arrest the implosion of SA’s water resources,” Le Roy warns.